Available for a variety of devices, PowerSkins are, in a sentence, silicone cases with built-in batteries from which your phone can sip juice once its internal supply has run dry. With the help of the kind folks on XPAL's PR team, I hooked my EVO 4G up with one and am now ready to report on the aftermath. Read on for the full review - and the terms of our 10-case giveaway! The giveaway is now officially over, and the winners have been selected. Scroll toward the bottom of the post to see if you're one of them! As stated previously, the basic premise of the PowerSkin is to combine an extra (1500mAh) battery with a (somewhat) durable smartphone case. Juice is transmitted to your handset through the little microUSB connecter at the bottom of the case. The PowerSkin in turn receives power through a microUSB port on its side, so you can reenergize it with your existing phone charger - no need for yet another proprietary wire. While the case is charging, four LED lights (each representing 25% of the total juice) will light up to show you the approximate charge status of your PowerSkin. XPAL also claims the PowerSkin can shield your handset from the dangers of the everyday world, though I'm somewhat skeptical about the veracity of that assertion - see the "Minuses" section. Additionally, the case is made of 100% recycled materials, which is always refreshing to see. Almost completely recharges my EVO - this is the main purpose of an extra battery, right? Fortunately, the PowerSkin handles the task quite well, as suggested by XPAL's advertised extended talk time of 4.5-8 hours. When my EVO's 1500mAh cell was completely out of power, the PowerSkin was able to recharge it up to about 90%. 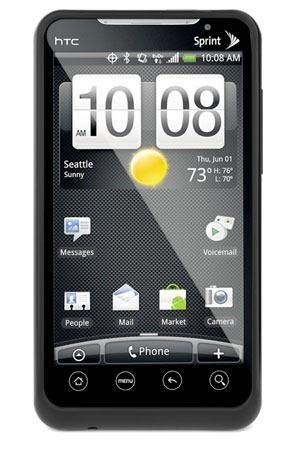 However, note that your experience may vary depending on the phone model and the capacity of your battery. Why your device is in the PowerSkin, its power and volume buttons are very easy to press. Due to the extra skin surrounding the power and volume buttons, you should have no trouble pressing them while they're in the PowerSkin. Charges the phone quickly and can be charged quickly - that's right: not only does the PowerSkin fill the phone with juice just as fast as a wall plug, but the case itself can be charged in about two to three hours. Not too shabby. 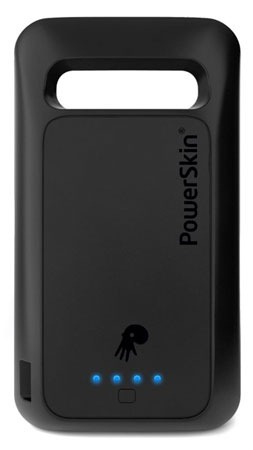 Phones don't have to be rebooted to be charged by the PowerSkin. While an OEM battery serves as a replacement for the battery that came with your phone, the PowerSkin is treated as an external power source. Ergo, XPAL's cases don't require you to remove your phone's existing battery, thus rebooting it; simply insert your device into the case, and voilà - you've got extra juice. Easy-to-access slots for the phone's ports - plugging objects in to the headphone, microUSB, and microHDMI ports is an extremely simple affair despite the silicone surrounding their openings. The camera isn't covered either, so you can snap pictures just as you would normally. There is an exception, however - see the last item on the "Minuses" list. Indicator lights - when you connect the PowerSkin to a microUSB cable in order to charge the case, four handy blue indicator lights on its back (each light represents 25% of the PowerSkin's charge status) are illuminated to let you know when it's full of juice. Universal connectivity - the PowerSkin can be charged using a regular microUSB cable, so there's no need to go hunting for some proprietary cable every time you want to fill it with juice. This thing is fat! I can see why this is so, but that doesn't make it any less disheartening. Because of the extra girth the PowerSkin adds to my EVO (a whole 8mm), I've decided to use it only when I need more power, not as a permanent accessory. You'll definitely need to take some time learning to love the PowerSkin's bulk. I'm not convinced about its durability. Now, I should preface this by reminding you that I haven't really put the PowerSkin's durability to the test - call me a chicken, but somehow, I didn't feel like hurling my EVO against the wall. However, you don't have to be a complete savage to observe that the PowerSkin doesn't exactly fortify the front of the phone. At least on the EVO version of the case, the silicone comes to an abrupt halt at the edges of the phone, leaving its display open to any damage that may come. Moreover, the handset must be firmly attached to the PowerSkin's microUSB connector (which can be tricky - see the next bullet); otherwise, it'll lurch out of the case the moment you touch it. Getting a device in the case is way too hard - the PowerSkin's microUSB connector doesn't stay in place; it jiggles around when you try to insert it into your phone. Covers the EVO's kickstand - obviously, this won't be an issue if you use the PowerSkin with a kickstand-less device, but for those rocking EVO 4Gs and ThunderBolts, not having access to that handy metal bar can be incredibly frustrating. All in all, the PowerSkin is a useful tool to have around, though in most scenarios, I'll only use it when I need the extra juice - the added bulk ensures that I won't be keeping it on my EVO permanently. Overall, these are pretty reasonable asking prices - a high-end case and an extra battery would likely cost the same amount when bought together. Ah yes, the review isn't all, dear reader; XPAL has been kind enough to send ten of you free PowerSkins. Better yet, they've agreed to let us choose winners first and decide on phone models later - in other words, the type of case you receive will depend on the device you own. Entering the contest is really simple – just make sure you complete both steps 1 and 2. There are 2 ways to play; complete either one of them to be eligible or both to double your chances of winning. Like/fan both the Android Police and PowerSkin fan pages, then Like the entry for this article. Fill out this form so that we know whom to contact if you're a winner. Again, both steps 1 and 2 are required to enter. The contest starts immediately and runs until June 14, 11:59 p.m. PST. Winners will be announced here and notified via Twitter, Facebook, and email.